This is the tale of Bamse, the huge St. Bernard dog who lived during the 2nd World War. Bamse was owned by Captain Hafto of the Norwegian Navy, and went to sea with him on the minesweeper Thorodd during the war. He achieved legendary status in Montrose, Scotland, where the Thorodd was stationed, as tales of his adventures, courage and kindness spread. The Bamse story was brought to the attention of the Montrose Heritage Trust by Mrs Henny King. As a member of the Montrose Port Authority board she first heard about some of the exploits of this huge St. Bernard dog during the Second World War from Captain Johansen, the then harbour master. With the dog having died and been buried in the town she felt that even the few details that had been recounted made a wonderful story that would be excellent publicity for Montrose. Bamse is somewhat of a legend in his native country Norway, but none of us were quite prepared for the wealth of information that would be uncovered or the huge interest that the project generated both here and in Norway and Canada. 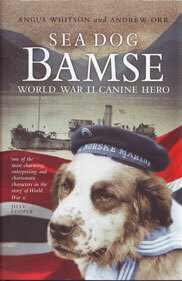 In 2008 a book on Bamse, 'Sea Dog Bamse', was published by Birlinn. Written by Angus Whitson and Andrew Orr, the Bamse stories are set against the background of the invasion of Norway and the escape of many to the UK. It's a great read and already over 4000 copies have been sold all over the world. The Bamse book by Angus Whitson and Andrew Orr has now been published by Birlinn. Read the history of Bamse by the people who knew him. Video footage of of the Bamse unveiling ceremony. Go where Bamse went on the Bamse Walk.